In this Travel Checklist column, we ask entrepreneurs to open up their carry-ons and share the items they can't leave home without. For Jody Levy, travel is an experience of both body and mind. 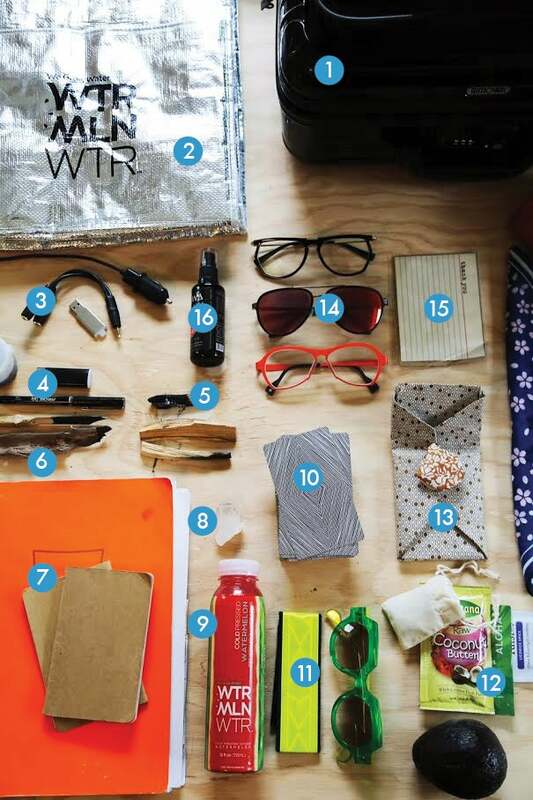 As such, the co-founder and creative director of WTRMLN WTR, a cold-pressed watermelon water, she packs her trusty hard-shell carryon with an array of healthy snacks, art supplies, and yes, even tarot cards. Levy logs an estimated 175,000 miles a year -- Los Angeles, Denver, and Detroit are common domestic destinations, while London, Tulum, Mexico, and Cusco, Peru, take her abroad. “I gather my creative inspiration from traveling and experiencing different cultures. Many of these places I travel to frequently to foster local love for WTRMLN WTR. For example I recently traveled to my hometown of Detroit to ensure an incredible, unique and successful launch,” she says. During a recent layover back home, we asked Levy to open up her suitcase -- and reveal the treasure trove of goodies this road warrior brings to connect her body and mind while she’s on the road.